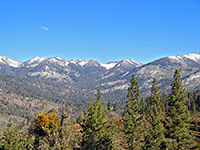 The Hotel Creek Trail climbs 1,500 feet up the north side of Kings Canyon giving hikers excellent, long distance views up and down the gorge, especially from Cedar Grove Overlook after 2 miles, reached by a short spur path; the main route continues to a junction with the backcountry Lewis Creek Trail, the first part of which can be used as an alternative way back to the start, making a loop hike of 6.4 miles. 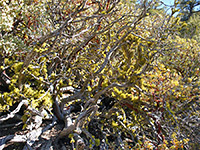 The paths cross varied landscapes of pine woods, manzanita bushes, meadows, open grassy hillsides and moist streamways, and although moderately strenuous owing to the elevation gain and the sometimes hot conditions (as most of the journey is over exposed, south-facing slopes, with little shade), the walk is quite popular. Hotel Creek Trail topographic map, Cedar Grove location map. 12 views of the Hotel Creek Trail. 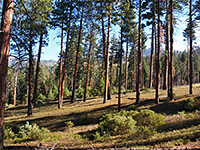 Parking for the hike is along a side road past the Sentinel campground near Cedar Grove, at the end of the one-way northside drive (the Motor Nature Trail) - a 3 mile unpaved road that provides a less-traveled alternative route along Kings Canyon. The well marked path starts through a cool, shady forest of pine and cedar trees at the edge of the valley, next to a small trickling stream, though it soon rises above the woodland into more open, chaparral vegetation of chinquapin, canyon live oak, and red-barked manzanita bushes that sprout attractive pink flowers in springtime. Hotel Creek flows down the hillside a little way to the east, out of sight though sometimes within earshot, and may be reached by a short side path. This first section of the main trail has the steepest gradient, as it switchbacks northwards up the edge of the valley, mostly in full sun, climbing to a flattish, grassy, treeless area that shows signs of recent forest fires. The next stretch ascends a little more gently, via several longer switchbacks, re-crosses the stream, which is now enclosed by a band of tall grass and varied wildflowers, then turns west and becomes quite straight, traversing the hillside to an open plateau bearing tall, scattered trees of Jeffrey and ponderosa pine, where the trail divides. This is the first place where the high granite peaks of the Monarch Divide become properly visible - 5 miles north and up to 5,500 feet higher. The left fork is the spur trail to the overlook, descending gradually through the pines for 0.4 miles to a small rocky summit, projecting out above the canyon - a point that gives the best views of anywhere on the trail. 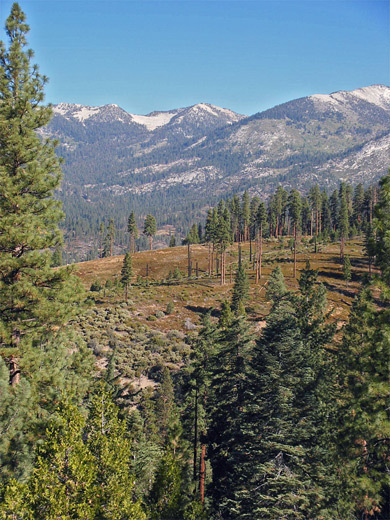 Cedar Grove village lies directly beneath, all covered in thick woodland apart from a field used as a corral, while opposite are Lookout Peak, Sentinel Ridge, Avalanche Peak, Sheep Creek, and the course of the Don Cecil Trail. The right fork also stays fairly level, winding over grassy, partly wooded hillsides for 1.4 miles to the Lewis Creek Trail junction; turning left, a steep descent soon begins, and the path meets Highway 180 about 1.5 miles west of the starting point.